Being at NCAA’s has so far been unlike any competition I’ve ever experienced before. As a freshman, it definitely has to be a different kind of experience than my seasoned teammate, Lauren Penney, of which this will be her last NCAA experience as a collegiate athlete. I’ve had my fair share of racing experiences, as I was fortunate to have a good high school coach and be a part of a nationally ranked high school team, giving me some experience into the world of higher-level competition. Despite being able to compete at high-level competitions in the past, such as the Junior World Championships, being able to compete at the NCAA DI track and field Championships is similar in some ways, but also an entirely different type of experience. I was so happy to qualify for nationals in itself, and being here has definitely taught me some things about collegiate racing, as well as being a lot of fun. Eugene is a great city, being Track Town USA and all, it was inevitable as a tracklete that I would enjoy my time here, but being able to see Hayward Field, let alone being able to race there was extremely exciting and an unforgettable experience. The environment at a collegiate national championship is so uplifting and inspiring, not only being a collegiate runner, but for anyone! Just the energy here is enough to get you excited about running! Being able to witness people who are just like any of us, passionate people trying to achieve their goals, breaking records and winning national championships is enough to inspire anyone in my opinion. As for my race, the 3000m Steeplechase semifinals, it did not go nearly how I had hoped it would. I went into the race feeling a little tired the last couple days, so I guess I was nervous about that, let alone the general nervousness that comes with being a freshman racing at Hayward Field in the NCAA Outdoor Track and Field Championships. I fell off the pack about halfway through the race and I just couldn’t recover to finish in the top five and move on to the finals, missing my goal as I had hoped to qualify for the finals and see what I could do there, but gaining a lot of national championship and general racing, experience. Nevertheless as my coaches and my teammate Lauren told me after my disappointing race, these things happen. This sport is filled with disappointment and joy, but that is the nature of it and that’s why we love it, because the ups and downs are what remind us that there’s always another day to move forward and another opportunity to do what you love, run. 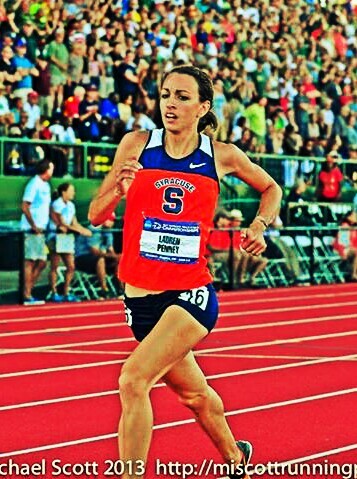 Now, as my racing portion of this experience is complete, it is time to focus on another race tonight, Lauren Penney’s! I am so excited to watch her in the 5k tonight because she is one of the toughest competitors I’ve ever seen and one of the best teammates too! She can compete with anyone in that race and I know she will, I just can’t wait to get out there and cheer her on victory!! It has been a pleasure being a guest blogger in Lauren’s blog, and I’m sure her post race entry will be coming soon!! 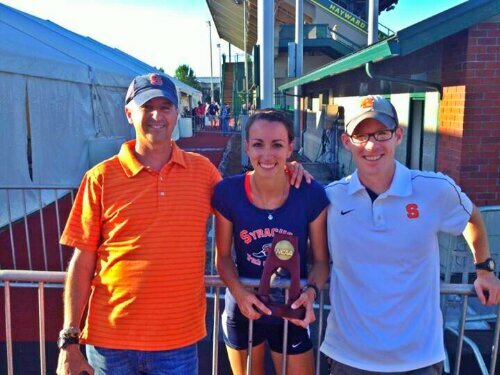 First, it was my first experience becoming an All-American, and I became the first female cross country All-American at Syracuse University, which is something I’m very proud of. Second, becoming an All-American had been a goal of mine all season and I think I had one of my more courageous races, going out faster than I ever had to put myself in position to accomplish it. Third, my coach’s only advice before I got on the line was, “You’ve worked hard for this, it’s time to go have fun,” and it truly was a race that reminded me that I run because it is something I love to do. I have been saying to anyone who has asked recently that I have gained a lot of confidence and lately I have been getting anxious and excited instead of nervous. This is true, except for this past Friday. I have to say, mixed with my excitement was a nervous twinge. After all, my record with National Championship performances wasn’t the best. The videos on replay in my head all day kept alternating between my awesome workouts and my miserable feelings at the last two National Championships I had competed in. And this one had even more pressure, being my last race in Orange and with a couple extra sets of eyes on me as I was approaching my post-collegiate career. So as I was looking at myself in the mirror, minutes before heading to the track, trying regain the confidence that has helped me so much this past year, I suddenly remembered filling out that application. I thought to myself this is no different, I have the same All American goal, I know it might go out very hard and I’ll have to put myself in whatever race I’m given, I did it then so why not now? And that was it. I suddenly couldn’t help smiling and I was ready to go. It turned out only the first lap was fast, but still that meant waiting two nerve-racking miles for the break to come. I put myself in a nice spot, not boxed in just in case the break came early, and not in the mess so I didn’t waste energy just trying to stay on my feet. When it came, I was prepared. A lead pack of six broke away, and I was left with four more. I knew this was my group. It was a little windy down the back stretch so I knew I didn’t want to be alone. Then with 1000m to go, the girl leading my pack tripped right in front of me (major congrats to her because she picked herself up and still placed 10th). From then on I was alone in seventh, but I knew many others were close behind. I gave it everything I had, and after a great kick from another girl who passed me with 150m to go, I crossed the finish line realizing I had finally done it. I actually remember trying to count the girls in front of me while coming down the home stretch, and then thinking you idiot, just finish! Eighth place; I just got my All American. I got to stand on the podium and smile for the pictures (I couldn’t stop smiling) and then I got randomly selected for a drug test (Of course being dehydrated from the race it took two hours and four attempts). But then I got to have dinner with my parents and try to answer the 48 text messages and uncounted Facebook comments and Tweets. I am so thankful for all of the support that everyone showed. I spent the rest of the night with Bri, just watching TV in the room all night, taking it all in. Of course, typical post-race, I couldn’t sleep at all, which wasn’t helped by the constant need for the bathroom after trying so desperately to go earlier. Since then everything has been a bit overwhelming, but exciting nonetheless. The realization that I am no longer in the NCAA, no longer a Syracuse athlete, is taking its time, but the future planning seems to be happening very quickly. I’ve said it many times before, but it never seems efficient enough to convey how much I mean it, I am so incredibly thankful for my past five years, and I can’t wait to have many more reasons to write in the future. Two weeks short of four years ago, I remember staring out the window of the rental car on the two hour ride from Portland to Eugene. It was my first trip to historic Hayward Field, a chance to compete on the most famous track in the world, at Junior Nationals. The seven of us making the trip spent the night before huddled in my dorm room watching Without Limits as if we needed more pumping up for the trip. I remember the whole week like it was yesterday, touring the town, pictures at the track, pictures on Pre’s trail, pictures at Pre’s rock, lunch at Tracktown Pizza. I remember watching the elite races, being in awe of the speed, talent, and poise. 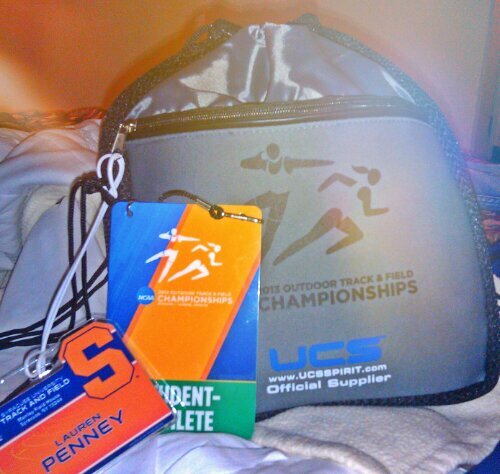 And now I am lucky enough to end my college career with another week in Eugene. Monday morning, our NCAA distance contingent (made up of myself and Bri, one of our freshmen who qualified in the steeple chase) did our pre-race workout. It wasn’t until after my last 200 that coach said, “Hey that was your last workout!” Still being hopeful for USAs, I can’t say that has really hit me yet. That very well could have been my last workout as an NCAA athlete! I feel like I’ve been pointing out “my lasts” constantly. Really weird feeling. A couple hours later we were heading to the airport. Much different from the regionals trip, everything went as planned. We had a layover in Charlotte, ate a nice dinner and went for a walk in the airport (since I couldn’t really double) and then hopped on the next plane to Portland. Fortunately, I got a good nap on the plane because we arrived in Portland at 11pm (pst). We spent the night in Portland and drove to Eugene Tuesday morning. This was my third trip to Eugene (got to watch the Olympic Trials last year, in addition to Junior Nat’s), but the first time I got a tour of the town from a native duck. My boyfriend’s future roommate is a true Eugene enthusiast, was an excellent tour guide, and provided a very detailed list of things to do and places to go for the week. I have to admit, it’s a pretty cool campus, even past Hayward Field. It’s very green, full of trees, and buzzing with people (I didn’t realize they were still in class). Finally, we embraced our true track nerdiness and huddled around my tablet to watch Without Limits. Unfortunately poor internet connection cut the fun short, but we were all still a bit tired from the time change and travels. It was time for a good night’s sleep. By Wednesday we were allowed to be at the track. I have to say, they really know how to make you feel important. The facilities are pretty awesome to begin with; there is a three lane warm up track and a big turf field on the south side of the stadium. The turf field was the athlete hospitality area, and I was pleasantly surprised to see that even our three-person orange crew had its own tent! There was also a large tent with tons of snacks and drinks for the competitors. Between this area and the track were all kinds of fan stands set up with souvenirs and tack memorabilia. We got these cards with our credentials. They were signed by aspiring runners from a local middle school with good luck wishes and invitations to write them notes of good luck as well! I thought that was so awesome! We had a nice run together, around the neighborhood a bit and back to Pre’s trail, before I dropped Bri off. Then I did a 90 second pick-up in the graveyard across the street (Yes, track nerds, the one from the movie) and jogged it back in. Walked back to the hotel, quickest shower ever, and walked back to Hayward to get some dinner at Bepe and Giannis, great Italian place right next to the track. Then it was back to the track for some men’s steeple prelims and women’s 10k action. It’s super exciting to see that kind of crowd at a track meet! My pre-race day was also Bri’s actual race day, so the early part was all about her (look forward to a guest post from Bri on being a freshman at NCAAs coming very soon!) Solid breakfast is pretty important for evening races, so we went to the highly recommended Glenwood. After some delicious french toast, we walked back to the hotel for some vegging out. I don’t like to sit here doing nothing but thinking race, race, race forever, so I pulled out some homework and worked on lesson plans (if you’re a teacher check out ldpnonfictionbookclub.wordpress.com). Then it was time for one last run on Pre’s trail, some strides in my spikes (same Victories I’ve worn all year), and pack it in. I made sure I had plenty of time to shower and get back to cheer for Donald and Bri. Donald got the orange ball rolling with an auto qualifier for the final! And Bri made me proud as a true freshman competing with the best. She has three more years to make it to the final and take the NCAA. I got Bepe and Giannis penne pesto to go, partly because I wanted to see more races and partly because I didn’t want to sit in a restaurant alone. Then I got to see the men’s 10k and the 1500 of the decathlon. Finally, walked back to the Days Inn and watched an episode of The West Wing before calling it a night. I had a big day ahead of me! The anticipation of a race used to be the most nerve-racking part. I used to feel the panic all the way up to the moment the gun went off, and then a flush of relief and trust in my fitness once the racing had begun. There was nothing I could change about my preparation once things were underway. This past weekend that was a little different. Nothing had changed from my plans to not lead, even though I knew the second heat was probably going to go out slow, but instead of trusting my strength in a longer kick, I was told to trust my speed. I never could have imagined that the race would go as slow as it did for as long as it did. With only a mile to go, we had barely picked it up and it felt like my entire heat was still in one big clump circling the track. Now normally at this point nerves are no longer a factor. You’re more than two miles in and it is pretty clear that you’re feeling great and you’re on a roll, or you’re feeling awful and you just want to finish. Yes, I felt great, but who wouldn’t at that pace? We were moving much slower than the pace that it took any woman who qualified to get there. It’s hard to tell how you’re going to handle the turnover. I’ve done it before and I knew I was prepared, but when the moment comes, sometimes it’s not that easy. I have had plenty of workouts that got me in a rhythm at a pace slower than I know I am capable of, but the rhythm is hard to break. And when you are surrounded by more than fifteen very capable women, it is impossible to know how everyone else feels and will respond. So with three and half laps to go I found myself trying to sneak a peek at the scoreboard screen to see how many were still in the pack, but it was too hard to tell. Three laps to go and the pace started to quicken a little bit. Everyone was getting antsy, and as the top ncaa competitor moved to the lead, I was finally able to tell that I was in a pack of five behind her. I knew we were slower than the first heat, so only four of us (in addition to the leader) were moving on to Eugene. Two laps to go and the nerves came flying in. Be patient started repeating in my head. Not yet, I’m trusting my 1500 speed. The pace was seriously quickening at that point. All of us in that pack knew what it meant. Bell lap; it was time to go, but the others knew it too. 300 to go and it finally started to string out a little bit, but I still wasn’t comfortable. I was on the inside of lane one, and a little bit trapped. I felt like I would have a kick, but if I couldn’t get out of there and other runners started to move on the outside I would have been in trouble. Fortunately, I found my opening and with 200 to go I started to take off. I trusted my speed work and it was worth it. I can’t emphasize enough how blessed I feel. I know that I have worked very hard to accomplish my goals, but it would have been impossible without the support I have had and the opportunities I have been given, first in getting to Syracuse, and then in the five years that I spent here. This race was incredibly important to me because, even though I’m still hoping to get into the USA meet, it gave me one more ncaa race in orange. It took a lot to get here, and I am thrilled that the end of being orange is still just a beginning for me. Of course it’s hard. It’s supposed to be hard. If it were easy everybody would do it…Hard is what makes it great. I came across this quote on Pintrest today, and how fitting because today was a workout day. In this sport, I often find myself asking why I put myself through it. To be perfectly honest, there are many time when it would just be so much easier to quit. Fortunately, today was not one of those days, but it definitely does happen. However, the feeling of accomplishment when you’re done, when you succeed, far outweighs the feelings of pain and weakness. In both races and workouts, there are days when I’m and I feel like I can fly the whole time, but that’s rare. Some of the best workouts and races come from grinding it out, pushing through the pain, and coming out on top. Running, especially at a competitive level, is hard; races and workouts are hard, and they should be. If they’re not, your not doing it right. That certainly is what makes it great. Yes, it has been a while since my last post; things got pretty busy with the end of the semester and traveling and such. But now school is out (even though I’m starting summer classes) and it’s time to start getting ready for the end of the season (my last orange season!). Last year was not my greatest spring season, but I somehow managed to get myself to NCAAs for the first time in my collegiate career. Once I got there, it wasn’t so pretty. I’m hoping I can get myself back there and actually show up to the meet this time! I’ve worked hard for it and the hay is in the barn; I’m ready to go. Last year and the year before on the Monday after all of the Last Chance meets, I went about my day as usual, except I was clutching my phone waiting for my coach to call. Waiting to find out if enough girls who had run faster than me those years chose not to declare in the mile and/or 3k for the NCAA indoor nationals. Two years. Two big disappointments. I was so angry and frustrated with myself for not being able to push a little harder to getting an auto-qualifying time. I let is become a motivational tool in my training over the past year. The pain my legs would feel in any workout could not compare to the pain of missing this meet by hundredths of a second one more time. I worked hard. I gained confidence. I did it. That same Monday night this year I had accomplished and gratifying feelings equal to the agonizing in the years prior. Before the meet, my coach asked me what had changed. He said even the way i carried myself was different, more self-assured. Confidence is key, and it is not something that can be coached or taught. It has taken me a really long time to get to this point, where I feel like I belong and deserve to be in some of the high caliber races that I have gotten myself to. I was ready. Trouble strikes when I have races like last night. I wish that I had an explanation; not an excuse, but something that I knew I could change for next time. The truth is it just wasn’t my night. With two laps to go, all I could think was just finish. Since the second I crossed the line, all kinds of thoughts have been racing through my mind. What just happened? I feel bad that my dad and boyfriend made the trek out to Arkansas just to see that terrible performance. That just happened on ESPN, in front of everyone in the country who follows college track. I sooo thought I was ready! How long has it been since a five minute mile was that hard or felt so terrible? I have to run 2k more than that in three weeks?? Why do I do this to myself? Dangerous thoughts that I cannot suppress. But I have to suppress them. It’s a chain reaction and a year ago I let the blow to my ego from not qualifying for NCAA indoor carry over to our outdoor opener. Another big important meet with a terribly disappointing result. I won’t let it happen again. Time to get back to work. June is a long way away. I wrote this for a class last semester. 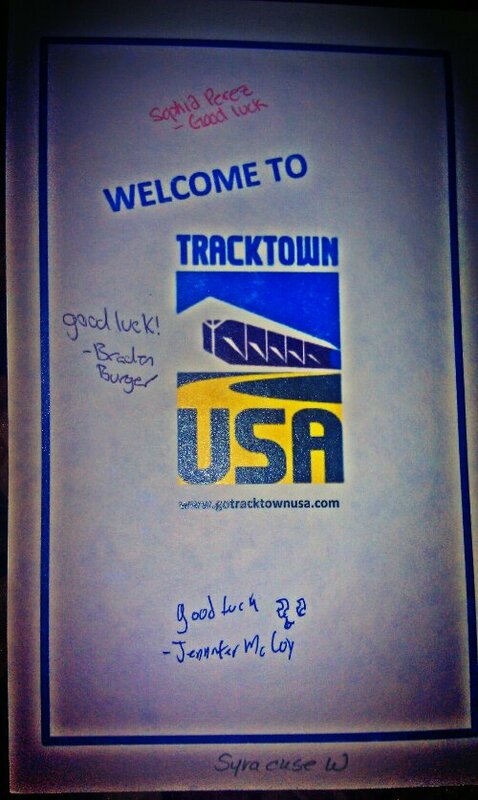 I reread it before my first race this season. Now, sitting alone in my hotel room anticipating the NCAA indoor championship 3k that I will race tonight, I wanted to take it out and read it again. A lot of people ask me if I get nervous for races, and answering that question was not my intention in writing this, but it is the best answer I have. One week into my freshman year at Roxbury High School I found myself on a bus, at night, on my way to a cross country meet. It was at Randolph High School, my town’s biggest rival, and it was going to be huge with great teams from all over New Jersey and New York. It was the Twilight Meet and my first serious competition as a runner. I had past experiences with cross country, but they were nothing compared to my new teammates. I found myself surrounded by ex-Junior Olympic competitors who had been running in big arenas since they were five. I, on the other hand, had a much different start to my running career. I can attribute my introduction to running to my dad, who began running shortly after I was born to get in shape, and ended up falling in love with it. Being the daddy’s girl I was (and still am), I wanted to do everything just like him. So at age nine, I ran my first 5k road race with him: The Hangover Run. The nine-year-old that I was had no idea what the name of this race implied, but I had gone to watch him on New Year’s Day for as long as I could remember and now it was my turn. I loved the rush, the people cheering, and the attention I got for being a tiny little girl running a big long race. I joined the town track team that spring, but I hated it! The cool kids played soccer anyway. It was not until four years later that I found myself intentionally getting in trouble at soccer practice so that I was told to run laps that I realized I should give running another try. And that’s when I fell in love. Eventually my love of running lead me to that bus ride, nodding my head the All American Rejects playing in my ear buds while I looked around at my new teammates. Some of the other girls were old pros and they were going to represent Roxbury in the varsity race of the season opener. As I sat on that bus, the one thing that kept me calm was knowing that I would not. I was not a pro and therefore I would be warming up with a JV race that night. The course was a 3k instead of 5k, and my score would have no impact on how the team placed. No pressure. Until there was pressure. There I was, scrawny fourteen-year-old in a pink Lake George sweat suit I had gotten on vacation that summer, lacing up my shoes and getting ready to warm up for the JV race, when my coach decided I could handle the extra 2k. To her, no big deal. To me, time to panic. All of a sudden my face felt flushed, my hands, which had been cold on that fall night, suddenly started sweat, and the sound of the music that had been playing at the finish line was replaced by the sound of my own beating heart. What did she mean I was in the varsity race? Was she crazy? I ran and found my parents to tell them they would have to wait another hour to watch me run. They were proud and excited for me, but I cannot say the same for myself. All that I felt was dread. What if I mess up for the team? What if everyone here sees me come in last place? I couldn’t control my shaking body as I walked back to my team’s tent. It was then that I ran into Ali, a senior on the team and one of our top two runners. I looked up to her so much and I wished I would eventually be as good as she was. “Just relax,” she told me. “You’ll be fine.” She tried to give me a heart-felt pep talk about having confidence and keeping it fun, but it didn’t work. I found no comfort. I tried to tell my coach I couldn’t do it. I tried to convince her that she was making a big mistake. She wouldn’t hear it. She had faith. I tried to tell myself I could always drop out if it was that bad, but then I thought that might be even more embarrassing. I knew I wasn’t getting out of this. I jogged my warm-up with the rest of the team, but I did not engage in their light-hearted conversations and laughter. I was completely silent as every possible bad outcome ran through my head. We finished jogging, stretched, and marched to the starting line. Finally, it was race time. Time to sink or swim. I stood with my team at the line on that dark night, under the spotlights, staring at the man with the gun in the middle of the field. The warning whistle rang through my ears and I knew it would soon be time to go. However, those next five minutes were agonizingly long; something that I have come to learn is a characteristic of all races. I never wanted to feel like that again. Arms out. “On your mark!” Why am I sweating so much? Stop shaking. Arms up. “Runners set!” Deep breath, keep it together. BANG! With a puff of smoke and the sound of the gun, we were off. My first of many serious races was underway. Three miles went by in a flash as the adrenalin ran through me. Now with two-hundred meters to go, every muscle in my body was burning as I saw the finish line getting closer and closer. One-hundred meters. Fifty meters. Done. I had done it. I finished the race. I didn’t pass out or spontaneously combust. And I didn’t come in last place! In fact, I had fun. I felt the rush that I had four years earlier, and I knew that it was a feeling I wanted to have over and over again. I chose to swim. Eight years later, I think about how my life would be different if I sank. Running gave me the friends that I am closest with today. It made me decide where to go to college. It changed my career plans from high school teacher to high school teacher and coach. It made me decide to put off those career plans while I fulfill my dream of being a professional athlete. It will always have a major place in my life, and all of those things might be different if I gave up that day. In those eight years, I have learned to love the sweating palms, the increased heart rate, and the smell of sweat in the crisp autumn air. Those things changed from meaning anxiety and fear to meaning anxiousness and confidence. Those things mean it is race day.